Rose is a fascinating, as much as a polarizing, perfume raw material due to two main reasons. For one, the natural extract can vary wildly according to the variety of rose variant used (the tea rose for instance possesses a completely different scent than that of the fruity, berry-plummy Munstead Wood), the cultivar and region (Rosa Damascena, traditionally coming from Bulgaria, is heavier and deeper than May Rose, traditionally coming from Grasse, though there are also Turkish, Moroccan and roses hailing from other regions) and the details of the method of extraction (different metals contribute their own little nuances in the end product etc). For another, rose by itself is an interesting, multi-layered oil, exhibiting facets of liqueur, wine, even pear or artichoke! Composing a fragrance based on the "Queen of flowers", as rose is affectionately named (jasmine is the King), isn't easy. This is also why most of the time there is very little, if any, natural rose essence, in perfumes. Constructing a rose bouquet with synthetics is far more elegant, in the mathematical sense of the world, allowing a precise calibration of the effect minus any distraction of off notes. Rose is also a fragrance note that needs getting some conditioning to. At least for me it did and I know I'm not alone. Rose scents can appear too old-fashioned for their own good sometimes (not old fashioned in the glamorous vintage sense of out-of-the-mold perfumes which dare to walk on stilts, towering over everyone else, but "grannyish" sorry to say). Nevertheless everything old is new again and rose is making a comeback in perfumery as a focal note (it never went away from the secret core of most feminine fragrances anyway). Luckily for me, Neela Vermeire Creations scored Bingo with their Mohur Eau de Parfum, which manages to smell at once contemporary and nostalgic, rich in second-hand reminiscences scaterred atop its jammy, lightly powdery rose dessert from Rajastan. It's a perfume which accompanies my softest thoughts. Now the Mohur Extrait de Parfum, rich in rose absolute, comes as the culmination of the succulence, tempting and caressing with the intensity of its purple color of the flacon; at once cool and warm, like the color purple unites the fieriness of red with the calm of blue, regal, ceremonial and mystical with its association to the Crown Chakra. 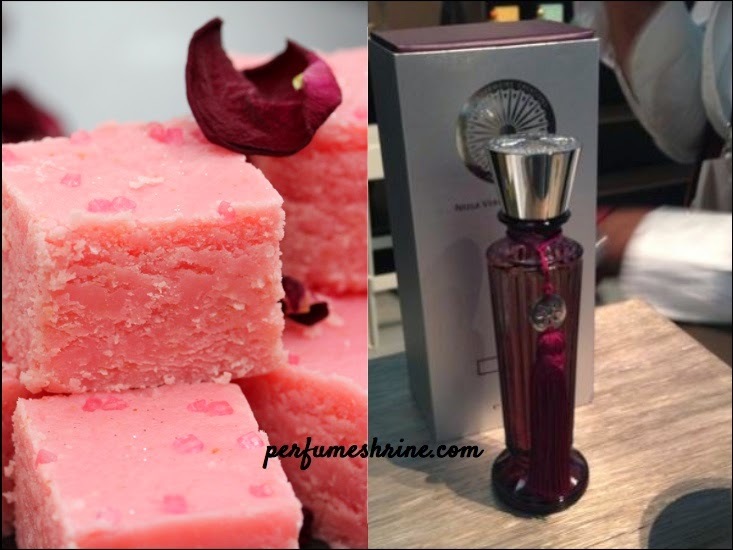 Honeyed facets of the rose are folded into a batter of powdery materials (the vegetal, subdued muskiness of ambrette seeds and the iris effect of carrot seed essence) while the sandalwood note takes on creamy qualities, deftly incorporated into this rosewater-flavored barfi by Neela Vermeire Creations perfumer in charge Bertrand Duchaufour (who also gave us another rose-dusted Ottoman-palatial-leaning phantasmagoria in Traversee du Bosphore for L'Artisan Parfumeur). Although the formula for the two is the same, the Mohur extrait is overall sweeter and rather more gourmand-smelling, with less of the aldehydic top notes of the Eau de Parfum, and while I think that the eau de parfum is personally speaking a very wearable incarnation thanks to its very drape-y softness which floats around me like a golden sari, I can't deny the exquisiteness of Mohur in pure perfume. If you can afford bringing so much beauty into your everyday life without keeling over, by all means, there's no point in searching beyond this masterpiece. 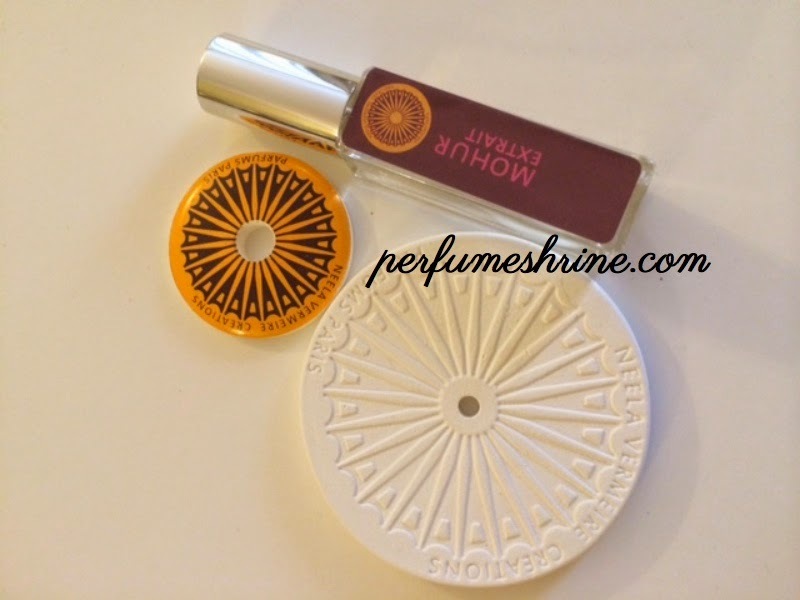 Mohur (in eau de parfum and extract de parfum versions) is part of the niche fragrances issued by Neela Vermeire Créations which also includes Trayee, Bombay Bling and Ashoka. These Indian inspired perfumes, like Chants of India, draw upon the tradition, history and cultural milieu of that vast Eastern sub-continent in which Neela herself has roots. These are truly "transparent orientals", modern and wearable, and therefore it comes as no surprise that Neela commissioned Bertrand Duchaufour to compose them for her niche line. Her e-boutique can be accessed on this link. 2. Please like Neela Vermeire Creations FB page or follow her NVC Twitter handle (whichever you have is fine). Draw is open till Friday midnight and winners will be announced sometime during the weekend. NB disclosure: The review/draw requirements/links are non affiliated. I was sent a sample vial by the company for reviewing purposes. This sounds irresistible! Please enter me for the draw. I struggle with all the different facets and characters of rose and I wish that I could distinguish between the different varieties more. As a teenager of the 90s, I grew up with the Sophia Grojsman big rose bouquets of Paris and Eternity as my introduction to rose and then the sadly discontinued Chantecaille Darby Rose. Balsamic, citrusy, heady, green.... there are as many different ways that rose is treated as there seem to be days in the year. I guess the fun is in trying out as many as possible! Funny, I'm wearing Rosa Magnifica. I like it best in the heat--in winter it's thin and soapy, but on a hot, humid day the narcissus and violet bloom and sweeten it. The bottle may be gone before summer's end--and then I'll move on, since it was discontinued so long ago. My favorite rose is still Nahema, but that's strictly a cool-weather rose for me. I am a lover of gourmand roses and this one is making my mouth drool. Sounds like something I really must try. To me jammy roses are the best! A rose-based scent from NV creations! Sounds Interesting. I have tried Bombay Bling from NV creations, and it is one of the better Mango scents I have tried. Rose-based perfumes are rather difficult to pull off for most men, but I have loved Une Rose, better than many of the Rose Oud Combos out there. Really looking forward to trying it! Another rose lover. I wear Sheldrake's Sa Majesté la Rose (Serge Lutens). Rose is a tricky one for me. But I have loved every NV that I have tried so I am willing to bet I would love the Mohur extrait too. I adore rose fragrances, so this would be a fun one to win. Some recent roses I've sampled and loved are Malle Portrait of a Lady; YSL Paris; Lutens Sa Majeste La Rose; Aerin Evening Rose; & Rosine Diabolo Rose. But, I'm still hunting for something more: darker, spicier, more unique, but still very rose. I've been wanting to try anything from Neela Vermeire for a long time! I read a lot about NV Creations! It would be lovely if I could just smell it now! :) Thank you for sharing! I am glad rose is making a comeback as I'm such a fan of the note in almost all its incarnations! I've sampled Mohur and love it. Love NV and had already liked her FB page! Thanks for the delightful giveaway! I would sure love to smell any/all of Neela Vermeire's scents. They have, so far, been elusive to me, but they all sound so incredible. I'm just beginning to explore the rose scents, and I've been interested in trying Mohur especially. Being a patchouli lover, and pretty much loving anything in the orientals, I've always been scared of the girlyness of rose. Lately I've fallen in love with Lutens La Fille de Berlin and L'Artisan's Voleur de Roses, both dark and mysterious IMO, but I'm still searching for the big dramatic evening rose scent. Hope this might be it. I have tried samples of Neela Vermeire's Ashoka, Trayee, and Mohur. I want to go sample Mohur again after reading this in-depth description. The new extrait sounds really special. I am also one of those people who had to warm up to rose scents. I seem to like the exotic, oriental or incense-y ones a lot so far. I love rose perfumes but I tend to gravitate towards darker and slightly fruity rose. which is why I fell in love with Nahema. Mohur sounds very interesting. I'd love to try it. I love the many scents of roses. I appreciate the commentary on the diversity of this flower. Mohur sounds like it might just be the perfect rose scent in a parfum. Wouldn't say I'm a fanatic for many floral scents, but roses are special to me. Would love to try it! Roses have been an ongoing trouble for me for years - from the Perfumer's Workshop Tea Rose and the Creed Bulgarian (current thumbs down). But I've always been fascinated by the importance historically of the basic scent - in fragrances AND in reality. I really am curious about this - particularly after such a beautifully written exposition. please do enter me for your very generous draw. I really enjoy rose scents, and i wonder: did/does perfumery often set roses centre stage because of olfactory facets unique to the rose family, or because that's just our cultural practice? Is there another flower as versatile that could have been our culture's 'rose', or could only rose have filled this particular role? I have been lucky enough to have the chance to sniff the Mohur extrait and I can confirm that it is exquisite. It was the first modern fragrance I've smelled in a really long time thar actually did make me swoon--my friend said I had such a look of joy on my face! Naturally I'd be thrilled to win some. Thanks for the chance. Please enter me in the draw! I have not tried Mohur in any incarnation, but do love a good rose scent. I think NV creations are delightful! Bombay Bling has been on my bottle list for a while. It's such a fun scent. I follow (like) Neela of Facebook with a different email than I'm using here. I have not always been a fan of rose fragrances but Tauer's Incense Rose has made me rethink this. I would love to try Mohur, and am curious about the other NVC perfumes. Thanks for offering to share! Just followed Neela on Twitter. I don't know the NVC scents well at all. I think I need reviews like this to be able to understand them. It's not the most dignified statement in the world, but I think it's a fact, for now. I am a dyed-in-the-wool rose-lover, from the actual blooms to functional scents to elaborate personal fragrances and everything in between (one of my first perfumes ever was made from two rose absolutes and jojoba oil). Win or lose, I will now be in a position to *really* smell Mohur, whenever that chance presents itself. I'm in the US. Thank you, Elena. I love a good rose scent...haven't sniffed this one year but have a feeling it will be a great one! I love and own Trayee, since i love it so much, i hoard it and only ration myself to use. The extrait sounds amazing! as i already love the EdP. Mohur EdP is one of the few roses that i can wear. Good luck to everyone! This is so fantastic. Thank you for the draw. The original Mohur was great so I know the extrait will really be wonderful. I've been a rose lover for years - I have rose sachets in all my drawers. There's just something about it I find irresistible. So naturally I'd love to try this scent! A rose is a rose is a rose... please enter me in the draw... I would love to smell these beauties. Rose was hard for me, too. I resisted for a long time until Tom Ford's Noir de Noir which was instant head over heels love. Since then I've slowly added more roses to my collection. Still can't handle Tresor or Paris though. Lovely review! I welcome this kind of beauty into my everyday life. Mohur is exquisite, and I jump at the chance to try the extrait. I liked Neela's FB page, as well as following on twitter. Thank you! I got distracted by my one and half year old yesterday when I posted my comment and had to cut it short. But I wanted to add this morning that I use rose water (or sometimes orange blossom water) as first "perfume" for my daughter. So roses are one of the first lovely smells she has been exposed to! I know it's very off topic and a random posting to ask on, but I was wondering if you have any other ideas for scents my daughter could use being so young. Do you know of any other first "perfumes" or perfumes made for young children? I find the rose and orange blossom waters at a local middle eastern grocery and figure their culinary uses make them safe for the skin as long as there is no allergic reaction. So far so good! These are wonderful for now, but will limiting as she moves from being a toddler to a young girl. Some variety might be nice. The topic of roses made me think to ask you, Elena. I hope you don't mind. Thanks for the info on the differences & difficulties of roses in perfume. I sampled Trayee & Bombay Bling and would love to win either prize. Also "liked" the Facebook page and plan to peruse it further. J. (btw, I use floral culinary use waters on my face, as toner. So lovely: both rose and orange blossom are very gentle). Another rose lover over here. My favorites: Une Rose Chyprée, Une Rose, Sa Majesté La Rose. I would simply love to try Mohur as I am sure it will be fabulous. Thanks for the draw! I love learning something new each time I visit Perfume Shrine. It is interesting to read about the differences in rose varieties and their varying characters as perfume notes. Mohur in EdP and extrait sound like two dazzling blooms, each with their own lovely personality. It is wonderful to hear that rose is making a comeback as a starring note. I never think of it as a granny scent, and enjoy it in lotion, rose water, soap, and perfume, but most of all in the garden. I have been dying to explore this line for a while now and am recently on a rose kick after ordering La Fille de Berlin...please consider me for the draw. Since it's seems my summer will be pretty vacation-less I can at least escape to more exotic locales through my perfumes...and going to India is on my bucket-list! I have just tried Bombay Bling and Ashoka from NVC , and both were extremely beautiful. I have been wearing rose parfums for many years: Paris, Une Rose...and the amazing Portrait of a Lady. I can't imagine how it can be this extrait, rich in rose absolute! I have been searching for a gorgeous gourmand rose and from your description Mohur extrait may be just the thing! I am inspired to try some of the other scents as well and have liked NVC on Facebook.Thanks for the draw! OMG I want to try this so badly. I had bought the discovery set and fell totally in love with Mohur, but then for some reason the shipping to Canada was discontinued. When I heard about the extrait I just about cried. Please count me in. I don't win stuff ever but maybe this one time fate will be kind. This sounds lovely! I love rose scents, but they don't seem to always love me - I would love to give this a shot and reverse my luck! I like Mohur, so I'd be interested in how the extrait compares to it. the review makes it sound lovely. Perfect draw- I do love bold character of NVC scents. Mohur is exquisite as EdP and hopefully extrait is even better! Would love to see rest of fragrances in this concentration as well! Liked FB page, thank you for the draw! Stil haven't tried any of her perfumes but they are nearly at the top of my list now. I love rose perfumes and have never had a problem with liking them at all. And I love everything from the light watery roses to the deep, dark and more exotic. I already follow Neela on twitter. I love Mohur EDP and would love to try the extrait as well! I already follow Neela on Facebook. I've always wanted a rose perfume that felt "like me" on my skin. I keep trying! Love Rose! Enter me in the drawing. I have a tiny sample of this. It is fabulous - rosy & golden in a grand but quiet way somehow. I got the range of these sents for another of the series, and kept finding myself drawn to this one more & more. I know honey, it's a bit "unfair" for Australians, but unfortunately the post office restrictions and mailing hassle make it difficult for Neela to extend this to everyone, though she would have liked to. It is indeed fabulous in scent. I hope you get to split some with fellow Australians privately, since the mail won't cooperate.